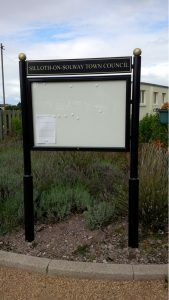 There are three Town Council notice boards located around the town: on Criffel Street (near the Public toilets), at Skinburness Road (on the bus shelter) and at the Community Hall on Petteril Street. Details of all Town Council Meetings are displayed on the notice boards, as well as official notices about elections etc. There is also a notice board on the Green, next the Community Garden which is used to advertise forthcoming events which are to take place on the Green.